Overwatch players have had many questions regarding Symmetra’s upcoming rework, some of which were addressed in a post on the game’s forums. The hero has been confirmed for a rework in the past when it was announced that the turret-building support would be moved out of that category and would become a defense hero. Since then, an Overwatch player posted on the forums in an attempt to figure out exactly which role Symmetra would call home. 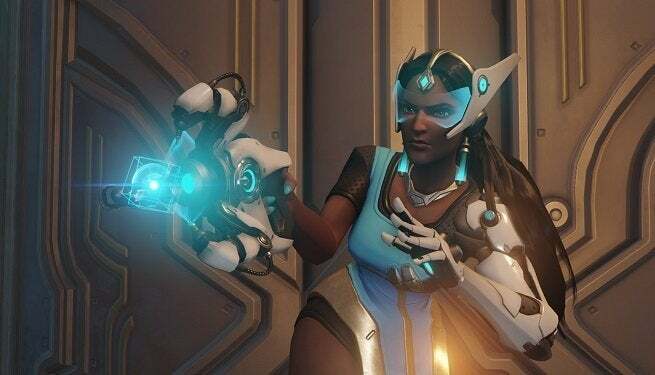 In a response to the post, Overwatch developer Geoff Goodman responded to say that Symmetra was indeed currently in the defense category, though a healer support rework wasn’t out of the question earlier on. A healer version of Symmetra would be one way to keep her firmly in the support category, but it does sound like it’d play strangely with her playstyle that would force teammates to sit by turret to be healed. The Symmetra rework hasn’t been finalized yet though as Blizzard is still experimenting with different playstyles. One of the ones that Goodman says is being tested at the moment is a version of Symmetra that allows her turrets to be deployed like projectiles and would otherwise behave similarly to the way they do now. “That said, we are playing with a new way her turrets deploy. Instead of having to stick them directly onto a wall herself, she can now fire an un-deployed version like a projectile, which sticks to walls/ceilings/etc. Once it sticks, it will unfold like it does on the wall currently when she builds them. Expanding on this version of Symmetra in another comment, Goodman explained exactly how these projectile turrets would work. When asked if the turrets would have an arc when shot or would travel in a straight line, Goodman compared their travel to that of Pharah’s rockets. A release date for Symmetra’s rework has not been given.